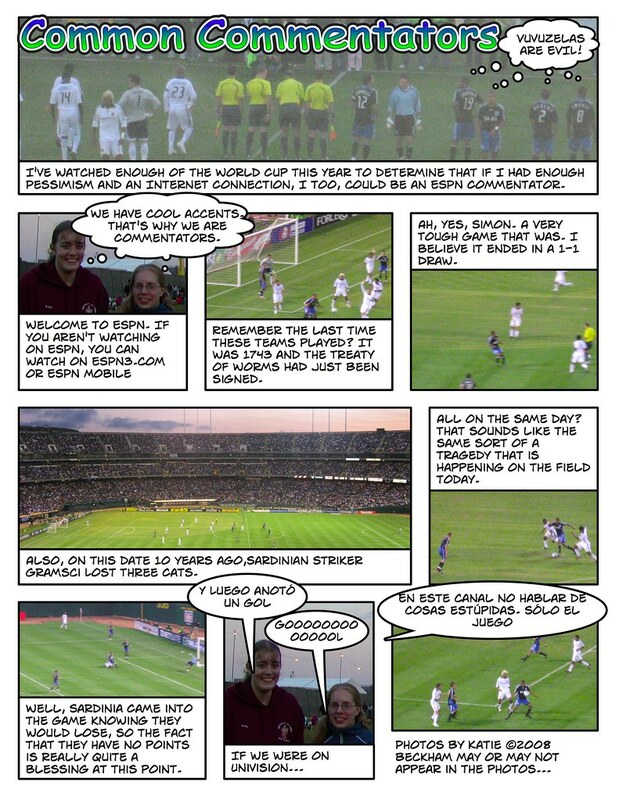 A new comic strip by myself and Simon K. Click (and then click again) to enlarge. For those of us who can’t be there today, here are two of the three pieces that will be sung at John Courter’s Memorial Service at Union Church today. Both feature John Courter on the organ and are sung by the Berea College Concert Choir, directed by Steve Bolster. The Agnus Dei is by Duruflé was recorded Fall 2002 at Berea Baptist Church. Wondrous Cross is arranged by Gilbert M. Martin and was recorded Summer 2002 during the Italy/Switzerland tour. Edit 2: The version of Wondrous Cross is now complete. Let me know if you have other problems with it. Edit: Thanks to Kristina who pointed out that this upload of Wondrous Cross cuts out right near the end. I’ll check my other versions tonight when I get home and hope to have an updated version (with the full piece) posted by midnight. There are posts we want to write, posts we don’t want to write, and posts we feel we must write. This is one that I do not want to write, but feel I should. I’ve known it was coming for a while, imminently for the past few weeks, and yet, I ignored it. I first got word that John Courter had died yesterday (Monday) morning via facebook. The news spread fast and I did not write a status message. I felt that it was not enough. I wanted to do more. And yesterday night I felt I could not write a blog post, but tonight I am sitting here in front of my computer, half of my screen filled with blogger.com, the other half with this picture. I saw this picture and tears began running down my face. I had to stop and get the kleenex box, for all of us who knew him, this is one of the images we have of him. He was, to the core, a musician. Give him an instrument, he would play, and gorgeously. I first moved to Berea in 1998 and knew him primarily as our church organist, albeit not a typical one. Union Church was the first place I’d ever heard improvisations like the ones John did. (In the context of Union Church, he is John to me…in the context of Berea College, he is Mr. Courter.) Needing no music, he could weave between hymns, fill gaps in the service, and make music like no one I had ever heard in person. He would occasionally play the Widor Tocatta and had it printed, each sheet on a 3″ x 4″ sheet of paper, all of the papers stuck together on a large piece of cardboard. Asked about it one time, he explained that it wasn’t like he’d ACTUALLY be able to read it or follow along, but it felt like a good backup. Those were the smallest pieces of music we’d ever seen. In the context of the church choir, which I was in (and out of) for a number of years, John provided an excellent ear and guidance. He was amused by clever lyrics combined with smart harmonies and wasn’t afraid to turn a blind eye to (or occasionally join) the disruptions of the bass section. Seeing him in this setting and in a concert or two, helped me change my goals for the future. I realized that I didn’t really like band nearly as much as choir and that the Berea College Concert Choir was a choir I’d want to be in if I went to Berea. And, of course, I went to Berea…but before I got into the choir (my 2nd semester), I took a class on hymnody from Mr. Courter and Steve Bolster (I was still in high school). For two hours every day, we’d meet and the first hour would be lecture, the second, singing. I learned more about the Genevan Psalter in those four weeks than most people will know in their entire lives! Then when I started college, I worked in the Music Department as the Assistant to Dr. B/Steve. (Again the multiple names from living in the town and going to the college.) Mr. Courter rarely came into the student office, but I recall him being one of the most mild mannered professors there. At the same time, I didn’t dare take piano lessons from him, because he scared me a bit too much. Kindof the same logic that I wouldn’t take piano or voice lessons from my current choir director/organist….then he might find out just how bad I was! I did enjoy hearing tales of my friend J. who took organ and carillon lessons, however. Second semester, I got into choir, and the choir went to Italy & Switzerland for tour. We left the day after graduation (Memorial Day) and while we were gone they were going to be moving the music department, so Mr. Courter had spent most of the past week attempting to pack up decades worth of carefully stacked music. He always knew where everything was, but that wouldn’t have been clear to a bystander! He came to the bus straight from packing his last box. In Italy, we saw a new side of Mr. Courter. 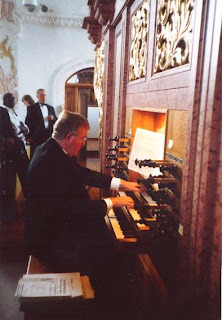 This was the side that didn’t back down to the monk at the Vatican who tried to push him off the bench so that he (the monk) could play the postlude. Mr. Courter was not having any of that. He was Catholic, he was at St. Peter’s…he was playing the postlude. And play he did. I don’t recall the piece, but I recall that it was a hot summer day in Rome, as they often are, and I wanted to lie on the marble floor to be able to feel every single vibration of the music as it rippled across the massive cathedral. (I restrained myself.) Then, in Siena, in another duomo where bare shoulders, bare toes, and knees were verboten, we had 5 minutes to change for the concert. All of us were led to a room to the side of the main hall and told to change. So we did. Several choir members remain scarred for life from that experience. One thing that is not evident, from my flipping through my Italy photo album, is that John Courter was immensely respected among his peers. Not just at Berea, but in the wider musical world. So much so, that my dad called to tell me a few weeks ago the Guild of Carillonneurs in North America, when they learned that John was dying, decided to do a concert of his works in honor of him at their summer meeting. Search for his name on YouTube and you’ll find videos of him playing postludes at Union Church, but also of people playing HIS compositions in the US and the Netherlands. I’m talking to my brother right now on IM and we’re discussing how on Thursday at 3pm, Union Church will be bursting to the seams with people coming to honor John’s life and work. He would have turned bright red at this notion, but he was deeply loved by his community. I will not be there to sing the three pieces for massed choir that he had chosen, though I will play them on my laptop while the service is live. I do not think I could sing though my tears, so perhaps it is best to have a large choir. I have delegated my voice (though not notes) to my parents, but I know many who are closer, who will be in attendance. As with much sadness, there is good that comes of this. John is no longer suffering from cancer, which he had been doing for several years. And he has left behind a throng of students, music and non-music, who he has influenced. For I look at the status messages of those I am friends with on facebook who have taken the time to write something and I figure that the number of students he has impacted, over his 39 year career at Berea, must be at least 1000 times that. As for me, personally, I think of him when I hear the Berea graduation marches, the Widor Tocatta, or any arrangement of Wondrous Cross. I just hope they have a carillon in heaven, otherwise they’ll need to get building. Just realized that my last post was very context free…so here’s a stab at some context. 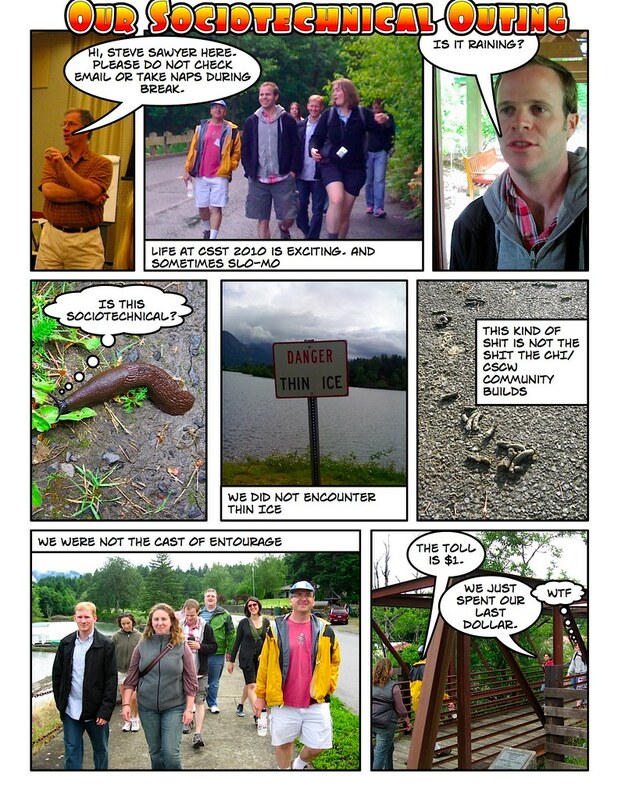 I’m at a camp this week called CSST or the 2010 Summer Research Institute for the Science of Socio-Technical Systems. I’ll hopefully get a chance to write more about it later, but it’s a great coming together of junior and senior researchers from all across fields of sociotechnical systems. So I don’t usually hang out or talk with people from management and sociology backgrounds about my research, but this was a venue in which to do so. It has been an amazing experience so far (we leave tomorrow), but one of the interesting parts has been the unstructured social time every day. 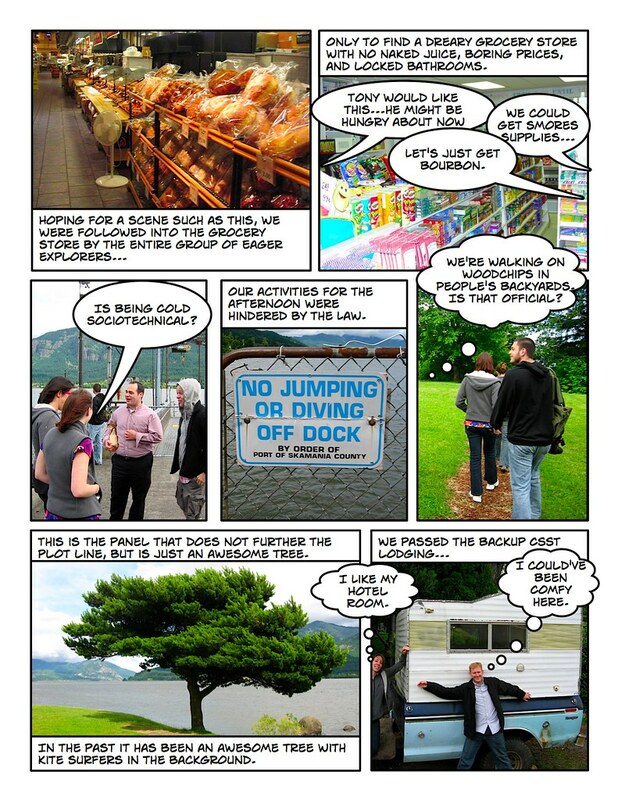 We documented yesterday’s time and turned it into a random, in joke filled comic strip. 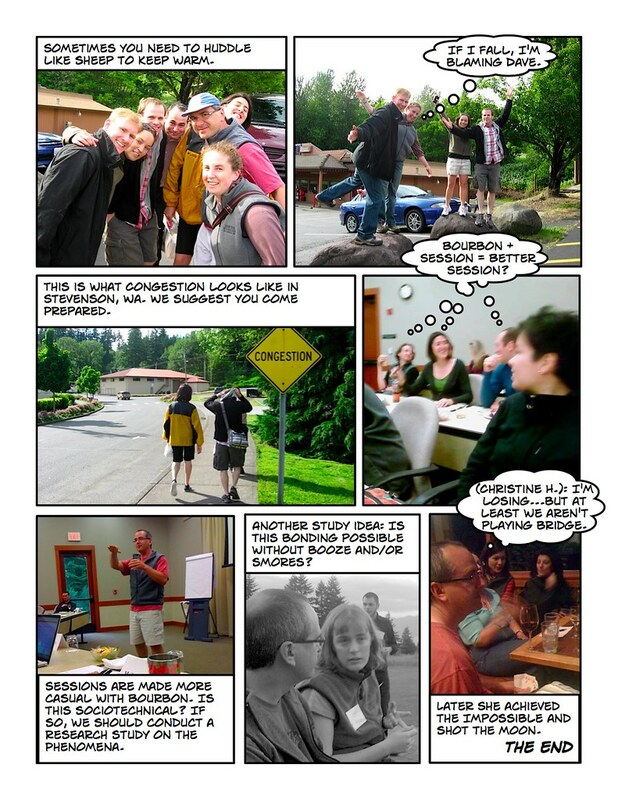 Having this software makes me think that maybe I’ll mess with this more as a form of storytelling so maybe someday you non-CSST folks will understand what the heck is going on (in comic book form).